Nissan's 30kWh has repeated history and been named the Best Small Family Car at the 2015 Next Green Car Awards  an award also given to the previous generation model in 2013. The judges made their decision using Next Green Car 's unique NGC Rating which evaluates the environmental impact of all new cars on the market. Other factors including the vehicles' capability, suitability for purpose, impact on their sector and their value for money were also considered. Chris Lilly, Content Manager at Next Green Cars commented; "The best-selling electric LEAF gets better still with a longer range and more kit. Now with fewer charges needed, the LEAF is an award-winning car in its own right, not just a winning EV." The new LEAF, which is soon to enter UK showrooms, boasts a 155 mile range on a single charge (+25% over the previous model), making it a segment leader. Nissan Motor (GB) EV Category Manager, Robert Tweedie, added; "Nissan is delighted that the recently launched 30kWh LEAF has won the Small Family Award 2015. 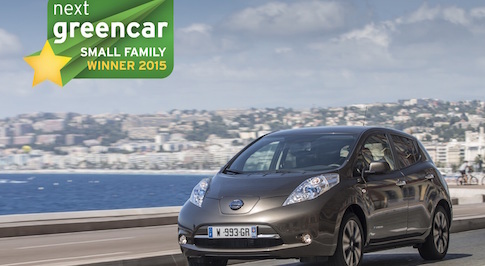 This accolade is yet more recognition of the all-round practicality of the LEAF, particularly as a family car."